Are You Brushing Your Pet’s Teeth? Are you brushing your pet’s teeth? Here’s why you should be! 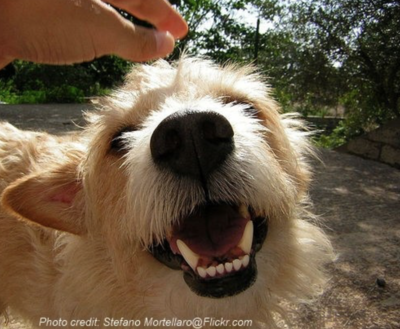 February is National Pet Dental Health Month…and for good reason! Did you know that according to the American Veterinary Dental Society, more than 80 percent of dogs and 70 percent of cats develop gum disease by the age of three years? Good dental hygiene is one of the most overlooked areas in pet health. This is a serious concern because dental disease affects not only the mouth. Left unchecked, it can lead to more serious health problems such as heart, lung, and kidney disease. Significant periodontal disease can cause bacteria and toxins to enter the bloodstream with potentially harmful effects on these internal organs. Good dental care is just as important for pets as it is for humans! Just as in humans, periodontal disease starts when the whitish bacterial film called plaque attaches to the teeth. Initially, plaque is soft, which is why tooth brushing or chewing hard food and chew toys can dislodge it from the surface of the tooth. If not removed, the bacteria in the plaque will die and become calcified. The resulting hard, rough, yellowish-brown substance is called tartar – and it can no longer be brushed away. Tartar is a magnet for additional plaque to accumulate, so the buildup continues. Unchecked, tartar and plaque lead to gingivitis, an inflammation of the gums, which causes the gums to become red and swollen and to bleed easily. As buildup continues and spreads below the gumline, infection can form around the root of the tooth. Eventually, your pet is blessed with bad breath, bleeding and inflammation of the gums, receding gums, and the loosening and eventual loss of teeth. Ouch! What’s a Pet Owner To DO? Your pet’s dental routine should be fairly similar to your own. The cornerstone of dental health in the dog or cat is regular brushing of teeth. It’s best to start dental care at an early age, but older animals can be introduced to teeth brushing as well. At any age, the most important thing to remember is patience! Tooth brushing is introduced gradually – begin by rubbing your pet’s teeth and gums with a piece of soft gauze wrapped around your finger. Concentrate on the outer surfaces of the teeth – which contact the insides of the cheek. Once your pet gets used to the experience, you may switch to a toothbrush designed for pets. Be sure to use a toothpaste formulated for animals (available at your veterinary clinic or at pet supply stores). Don’t expect to get every tooth on the very first time. Try not to be too forceful when restraining your pet. And above all, always praise and reward your pet for cooperation – however many teeth you actually get to clean! A dental check-up is a regular part of your pet’s annual exam. Even with brushing, it is likely that your pet will need to have a dental cleaning performed by the veterinarian at fairly regular intervals. But routine, at-home brushing of teeth can make a significant difference in the length of time that passes between these in-clinic procedures. And that’s good for you AND your pet!